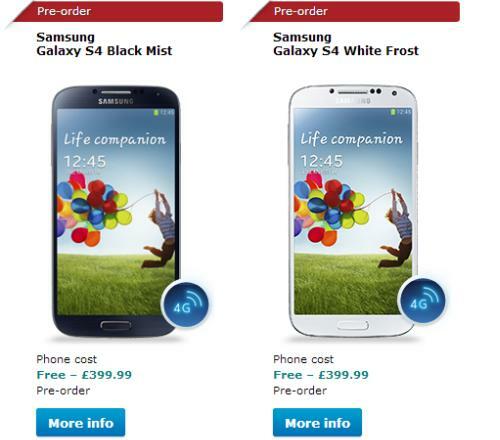 We are now only a matter of days away from consumers being able to get their hands on the latest smartphone from Samsung, and leading up to its arrival there has been a UK pre-order price cut for the Samsung Galaxy S4 as carriers position themselves to try and tempt users to get the device from them. UK carrier O2 has dropped the upfront cost of the smartphone to Â£69.99 on one of its contracts which is a drop of Â£30. This is on a Â£37 a month tariff that also gets you unlimited talk minutes and texts along with 2GB of data, and the company has scrapped some other tariffs it was previously offering. Another contract that costs Â£42 per month has had its upfront fee for the Galaxy S4 cut from Â£99.99 to Â£29.99, and comes at a time that the carrier has some stiff competition in the market offering consumers in the country the handset. One of the best deals we have managed to find so far is on Three UK that gets you the handset with no upfront fee for Â£35 per month on a two year contract, which provides users unlimited data along with 500 talk minutes and 5,000 text messages. Vodafone also has a Â£37 per month contract like O2 that is also asking for Â£69 upfront, and while the SMS messages and talk time are the same users will only get 1GB of data. We have heard previously that early indications show the appeal of the new Galaxy smartphone is far exceeding that of last year’s model. There will be some consumers deciding to wait for the Galaxy Note 3 instead though, which according to the latest reports will come with an aluminium form factor. Have you already pre-ordered your Galaxy S4? Been on Three since 2011 and they’ve been the best Network I’ve ever been on. Obviously it depends on your location, however I have much better signal with them than any other network and unlimited data and free tethering is the best, I use my phone as my main internet connection now. I tried O2, Orange, Tmobile and Vodafone before but they all sucked so badly and no unlimited data were major downfalls as that’s the thing I use the most. The other good thing is they don’t block any sites like other stupid providers do. where to buy it completely with any career but without plan and full payment?